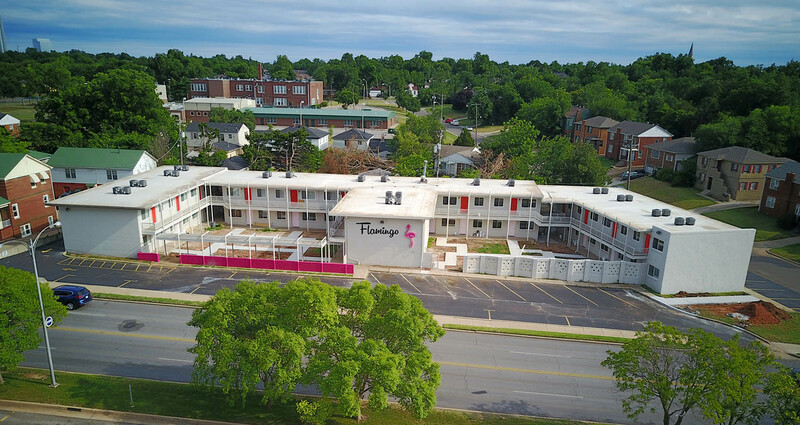 I was driving by the other day and what used to be a rundown motel at 23rd and Gateway just south of OCU has a new paint job and I saw a logo and the word Flamingo painted on the inside wall. Any info on this? 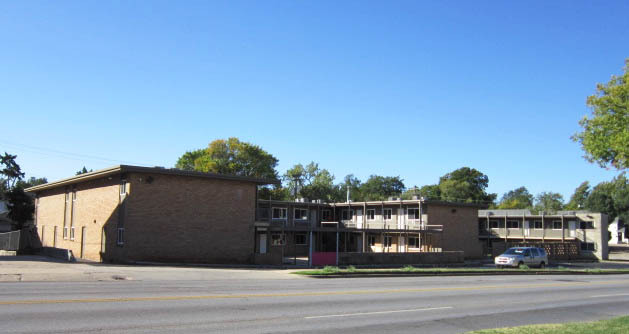 Yes, it was OCU housing and recently bought by a local developer and being remodeled into for-lease apartments. Address is 1844 NW 23rd. Very cool. It has that swanky mid century look about it. Sara Kate Designs is doing the design work. She is also doing Commonplace Books in Midtown. Much improved. Get some landscaping/shrubs going, especially under the sign, and it will look even better. Sara Kate does great work. Haven't been inside Commonplace yet, but it looks beautiful from the street. I live right by this project, so I've been able to see a lot of what has gone on during the remodel. They're definitely putting a lot of money into the place. Some of the things I've noticed: completely new central HVAC units on the roof, new windows and doors, solid surface countertops (either white granite or quartz, I think), and all new flooring. I'm not a big fan of the color scheme, and I wish they had torn down the old walls in front of the courtyards instead of just painting them, but overall this looks like to be a solid development for 23rd. I rode my bike past there on Sunday and noticed there is an old pool in the east courtyard that has long been filled with concrete. I'm sure that was from the hotel days. I really love the color scheme. It's different and gives it some retro personality. I do hope they spend some more money on landscaping, but I think it's great. The pool was open for apartment residents during the eighties and possibly even the nineties. ^^^ Great shot. and a cool looking apartment complex. The only things that are missing are a kidney shaped swimming pool surrounded by chase lounges and umbrellas, and well placed greenery all around the building. I definitely like the dceorative block wall on the right, which is more design appropriate, over the pink fence on the left. There was an old pool (from the motel days) in that left courtyard but had been filled in when OCU owned it. Looks like the new owners removed any remnants. I really love this makeover, but you're right, a kidney pool and some greenery would be the perfect final touches! I'm sure the final details will make a big difference. 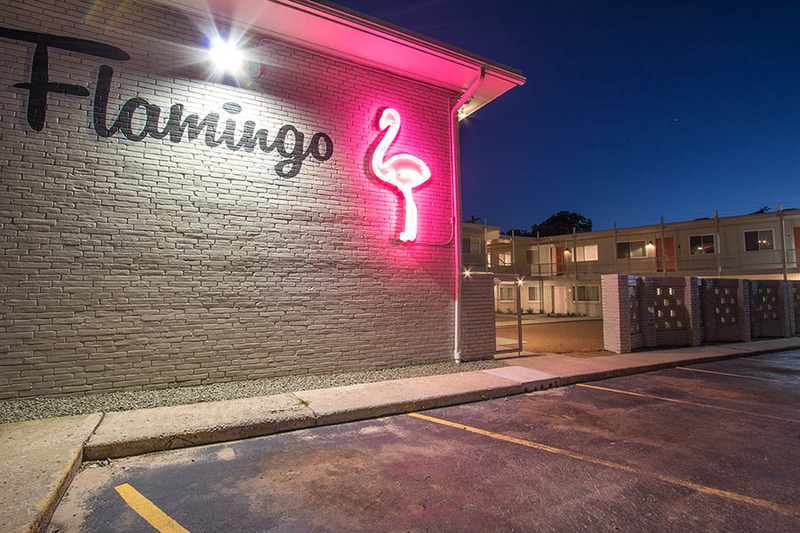 BTW, the flamingo on the facade is neon. Jason and Sara Kate Little have teamed with Ben and Jessica Chamberlain to bring high style to a previously nondescript apartment complex directly across from Oklahoma City University. Jason is a local real estate broker / investor / developer and Sara Kate owns the popular Sara Kate Studios in Automobile Alley. 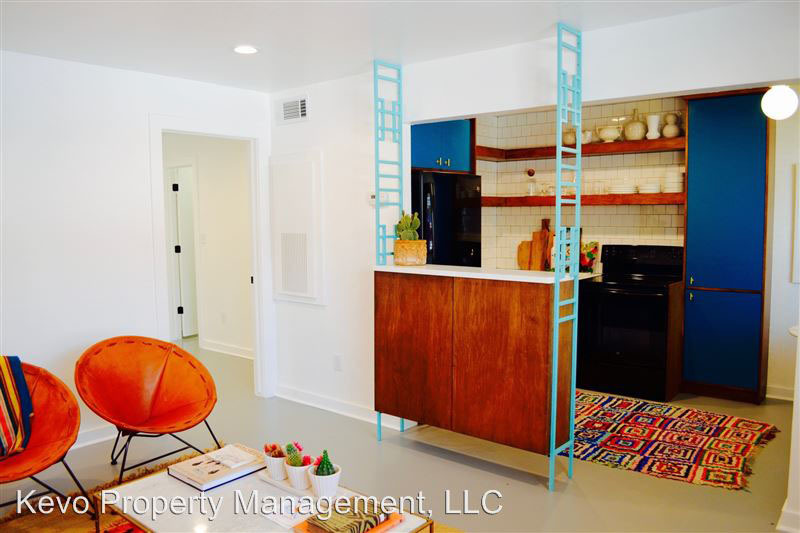 The Chamberlains have been renovating multi-family properties in historic neighborhoods for the past several years, and Ben served as general contractor while Jessica partnered with Sara Kate on design. 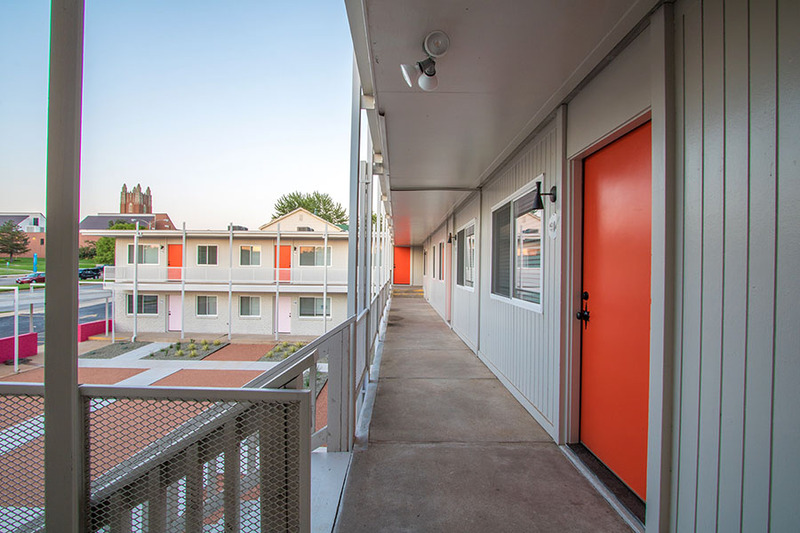 The 31-unit complex property was purchased last year from OCU then completely renovated with a Palm Springs mid-century style. 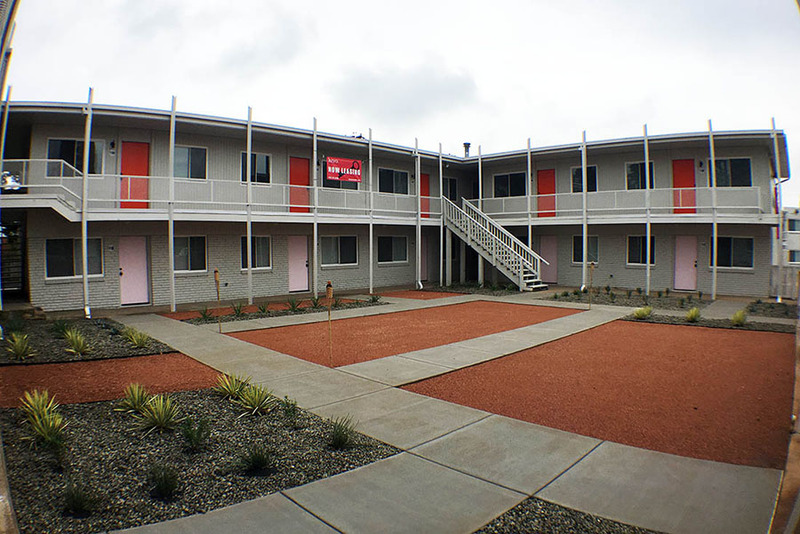 Each 1-bed 1-bath apartment is approximately 550 square feet with the downstairs units featuring sealed concrete floors with the top level getting cork flooring. 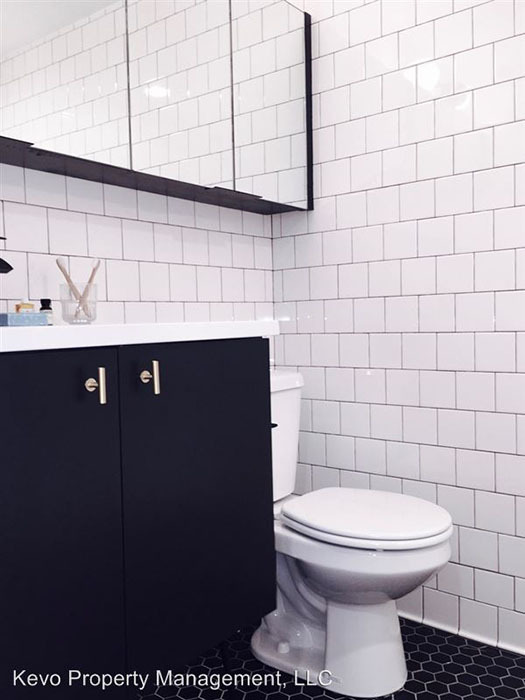 Bathrooms have been updated with subway tile and custom cabinetry and kitchens have new cabinets, marble counter tops and subway tile backslashes as well as retro-style appliances. 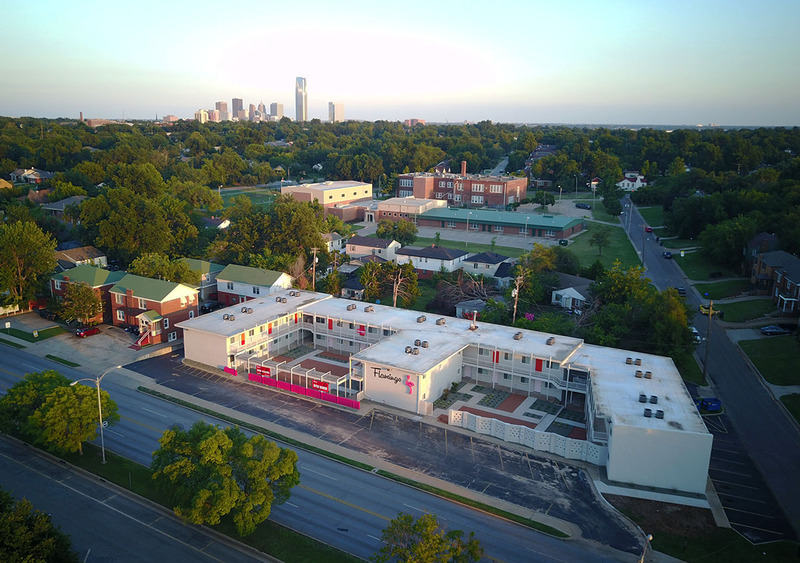 The building has a on-site laundry facility and offers easy walks to the Plaza District, OCU, Uptown and the Asian District. 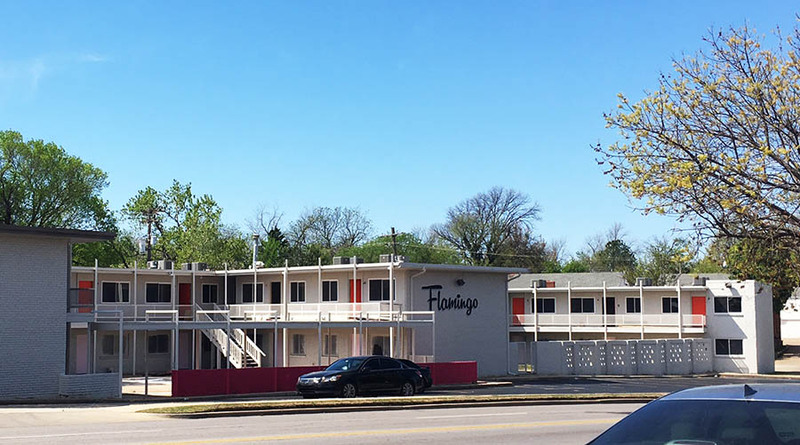 Originally built in 1961 as University Manor, Flamingo is now leasing at 1844 NW 23rd Street. 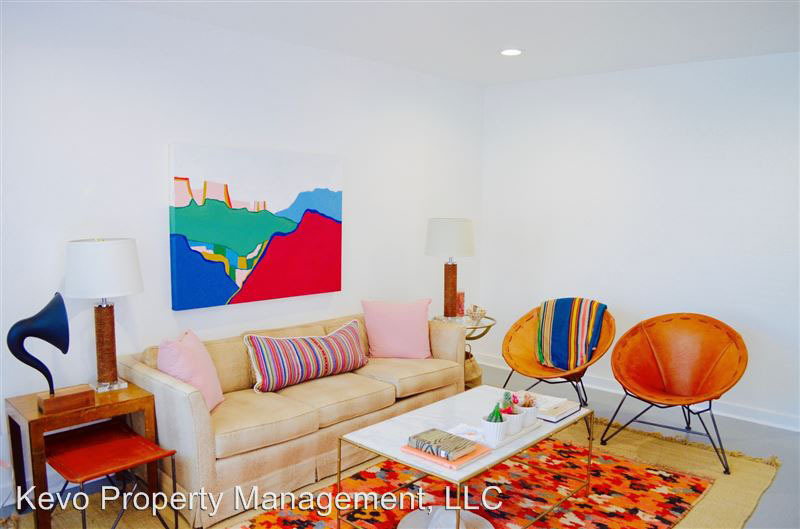 Inquiries for leasing a unit should be directed to Shawn Shafer of Kevo Property Management at 818-915-3168. Photo credit to Charlie Merida of Kevo for the interior shots. I love this! To me, it really has the feel of a mid-century motel, perhaps in Florida or California. The one thing missing is a pool. There was a pool in the east courtyard originally but somewhere along the line -- long before the current owners -- it was filled with cement. The pool was there in the late eighties and possibly early nineties. I remember driving by as a youngster, catching glimpses of people partying by the pool, and wishing I lived there. I love the mid-century look of this inside and out. like a time machine, very cool! Wonder what kind of price range these go for?